Randy Johnson A.K.A. 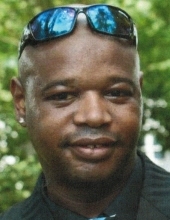 “Cheeze,” Age 39, of Dixon, IL passed away Wednesday, March 20, 2019, peacefully with his family at his side. Randy was born on October 10, 1979, in Freeport, IL. He was born to and was the proud son of Robert E. Johnson of Freeport, IL and Shelly Perkins of Marshall, WI. Randy attended school in Freeport, IL. On July 4, 2010, Randy and Melissa welcomed a beautiful daughter Brea Shalyse RL Johnson. She was the light in Randy’s eyes and the twinkle in his smile. After the birth of his daughter, you could have found Randy working at Somkit. Where he worked as a chef for the last 9 years. In Randy’s free time he would hang out with his family and friends. He would also watch sports; he was an immense Chicago Bears and Chicago Bulls fan. Randy is survived by daughter Brea (Melissa Portner and children Alexandria, Mia, and Anthony). His parents Robert and Shelly. His siblings; Anthony (Tami) Johnson of Browntown, WI, Samantha Johnson of Marshall, WI, & Shannon Johnson of Vernonia, Oregon. As well as his 13 nieces and nephews. Randy is preceded in death by his paternal grandparents, William Calvin Johnson and Cordelia Johnson along with his maternal grandparents Essix Simmons and R.L. Simmons. Randy will always be remembered for his big “cheezy” smile. Randy was vibrant, sweet, and so caring. He would give the shirt off his back to anyone in need. He was like a shooting star - one in a million. A simple beaming light; who silently, but gracefully expressed beliefs and exhibited dreams into people's lives. He left impressions on people. He gave people hope, even if it was for a second. Though Randy’s time on this earth was short, his memories will live on with all of us forever. He will truly be missed. The family will be holding a visitation, on Saturday, March 30, 2019, at 10:00 A.M. at Burke-Tubbs Funeral Homes (504 N Walnut Ave, Freeport, Illinois). A service will follow at 11:00 A.M. A luncheon will be held after services at Bible Community Church (2810 W Pearl City Rd, Freeport, Illinois) The Johnson family would like to extend many thanks to everyone for the support and prayers during this difficult time. To send flowers or a remembrance gift to the family of Randy "Cheeze" Johnson, please visit our Tribute Store. "Email Address" would like to share the life celebration of Randy "Cheeze" Johnson. Click on the "link" to go to share a favorite memory or leave a condolence message for the family.